Oliver was born April 14th, 2015. He was our second boy, and my pregnancy was totally different from my first, I was much weaker and in more pain. We assumed it was due to him being breached the entire time. I had a scheduled c-section because I had already had one with my first son. It turned out that when he was born he wasn’t breathing and was floppy. 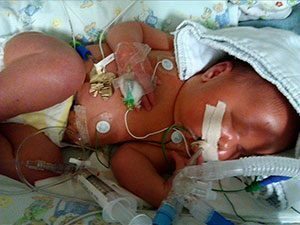 Once revived, he was immediately admitted to the NICU. The doctors were perplexed, they couldn’t figure out what was causing this. Olly was full term, but acting like a premie. They ran test after test, all came back negative. At this point we were freaking out, thinking the worst. After a week of ups and downs, and being intubated twice, we were transferred to Barbara Bush’s NICU at Maine Med in Portland, ME. The Doctors there were amazing, they immediately had ideas, at first they thought Prader Willi, but once again it came back negative. At that point, Olly had a feeding tube down his throat, so we knew we had to find an alternative, we decided to go through with the surgery for a Gastrostomy tube (g-tube). The doctors then decided to also take a muscle biopsy to hopefully gain answers of what was causing his muscle weakness. The biopsy was sent to the Boston Children’s Hospital in Massachusetts. We waited almost 4 weeks for the answer, and when we got it, it wasn’t good. At first, we were only told Olly had centronuclear myopathy. So we looked online, only to discover that there were many myopathies and extremely rare, almost unheard of completely. While reading, I knew he had the worst, the mtm1 x-linked. I don’t know how I knew but I did. My partner said “No, don’t think the worst.” But I knew. The neurologist sat us down and told us he had the mtm1. The survival rate was less than 2 months for most, we were determined to have the best time we could with him no matter how long it was. Our neurologist sat down with us with a palliative care nurse and presented us our options. We were told we could go to Boston and have the tracheotomy surgery. Along with this option, we were given an overview of what his quality of life might be like, not good. We immediately decided no way did we want that life for him. I had taken care of individuals with trachs and knew I didn’t want that life for him. 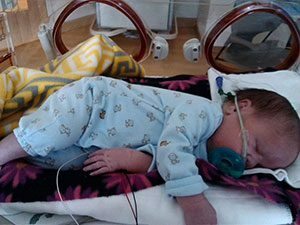 Our 2nd and final option was after 8 weeks in the hospital, we could go home with a hospice team,oxygen tanks, heart monitor and Joey feed pump. We could have him home and be a family for however long we were given and experience the family together. Again, we both knew this was what we wanted. We wanted him to get to know his big brother and be a family. Well, we began the process to go home. We set up all the medical supplies and hospice nurse who would be there with us multiple times a week. And the going home day arrived, we were very nervous. The doctors informed us that he may not make the ride home. Maine Med was located 3.5 hours from our home. But he was a trooper and made it perfectly. Once home, we were informed that going outside with him would be dangerous on windy days, humid days or if there was a high pollen count. But we didn’t care about staying inside, all that mattered was he was home with us. His brother was elated, he’s only 2 years old so he didn’t quite understand the machines that invaded our home but he took it in stride. We were told not expect much, don’t expect him to ever roll, or suckle. Don’t expect him to ever smile or move much if at all on his own. So we didn’t expect it. But he did it. He rolled in his crib, his nursed once, if only for 5 minutes and he smiled a lot. It warmed my heart and we began to have the hope of him living to Christmas at least. We were told a cold could be fatal for him or even the slightest sniffle. But never in a million years did we think he would just get tired from working so hard to breathe. If you could picture it, it was peaceful. Just us holding him while he passed on. He was comfortable, and woke up for a brief moment that morning to look at us one last time. Olly then just slipped into a sleep and passed on at 1:34pm, July 8th. Although our time with him was short, it was beautiful. And we don’t regret a single decision we made. He lit our lives up and brought us so much happiness. We love you little man.